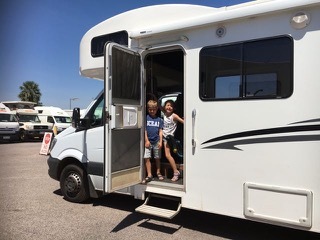 On the afternoon coming back from the Jumping Crocodile Tour we told Alex and Inez that we had a surprise for them… We got off the bus on the way and fetched the surprise: a camper van! 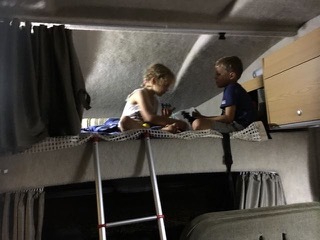 And what a surprise… not only do Alex and Inez get more space but they also get to sleep in the car!! 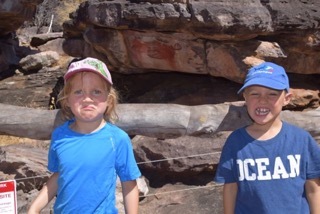 Alex and Inez were thrilled about their new “home” for the coming 3 days. 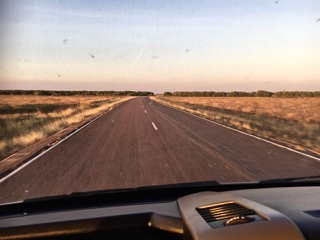 So off we went to hit the road towards Kakadu National Park taking us approx 3h from Darwin. 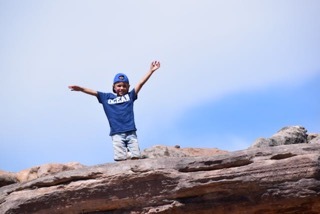 … and came into the park and bought our park pass. 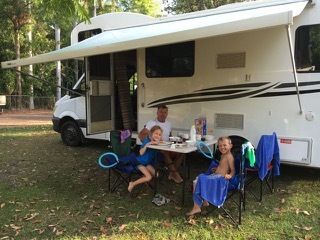 Now camping is also for us a first time experience as a family. 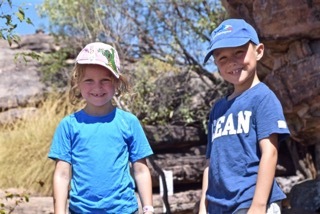 We have never camped together before (although you could consider sailing as camping…), but this was a great time together and Alex and Inez loved every minute of it and so did we! The very special spot was their cabin over the driver’s seat. 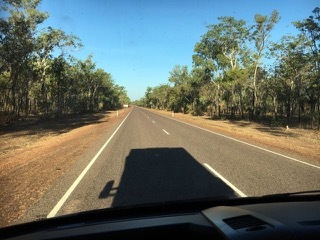 We went straight to Jabiru and parked at a lovely camping The Kakadu Lodge & Caravan finding a spot with no neighbours, just a green spot to run around on. 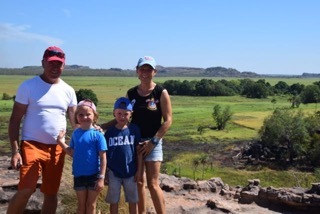 Kakadu National Park covers an amazing 20 000 squares kilometres and is on the UNESCO World Heritage List in recognition of both its outstanding natural values and as a living cultural landscape. 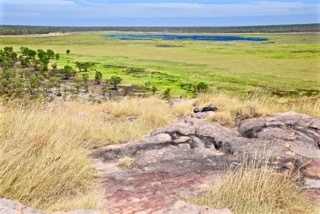 Aboriginal people have inhabited Kakadu continuously for more then 50 000 years (! 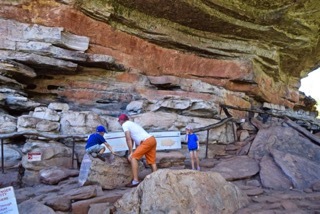 ), tracing back in time to before the last ice age. 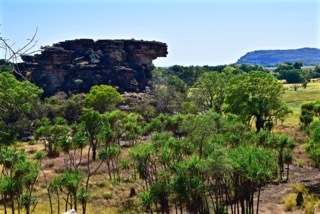 Ancient rock art showing long-extinct animals combined with abundant wildlife and spectacular landscapes gives us a profound visual and spiritual experience. 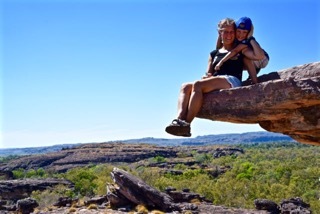 Kakadu’s complex ecosystem provides habitats for a wide range of plant and animal species. 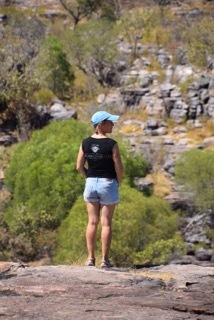 About one third of Australia’s bird species are found in the park. 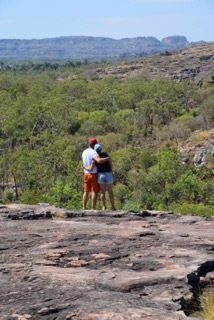 The Aboriginal people of Kakadu are known as Bininj / Mungguy. Bininj (pronounced binding) is a Kunwinjku and Gundjeihmi word: Mungguy (pronounced Moong-gooy) is a Jawoyn word. Both are similar to the English word “man” and depending on the context it can mean man, male, person or Aboriginal people. 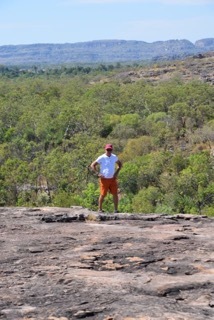 Balanda means non-Aboriginal people. 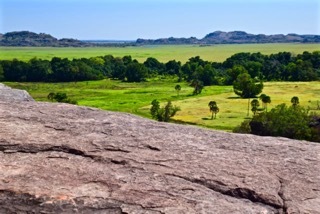 Bininj / Mungguy believe that during the Creation Time important ancestral beings, known as the first people of Nayuhyunggi, journeyed across the landscape creating the features and landforms, plants, animals and the generations of Bininj / Mungguy living here today. 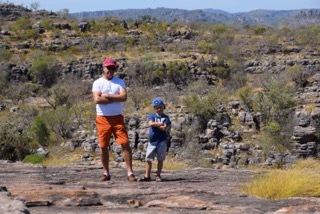 The land and its people have always been linked. 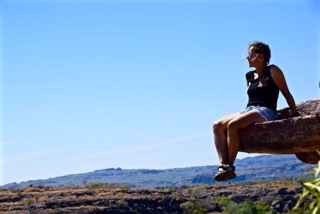 The name “Kakadu” comes from an Aboriginal language called Gagudju, which was one of the languages spoken in the North of the park at the beginning of the 20th century. 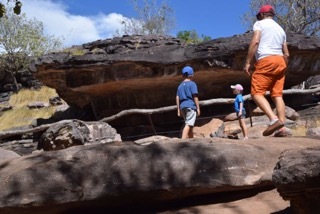 Aboriginal languages used in the park today include Kunwinjku from the North-Eastern region, Gundjeihmi from the central region and Jawoyn from the South. 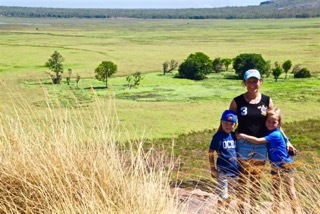 Our first visit in the Kakadu National Park was to be one of our favourite spots in the whole National Park: Ubirr. 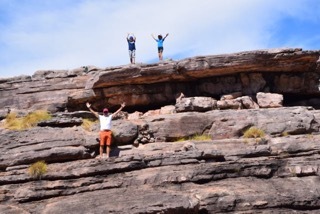 Not knowing what was awaiting us we spent one of the best moments in this park, affecting us emotionally, visually and spiritually. 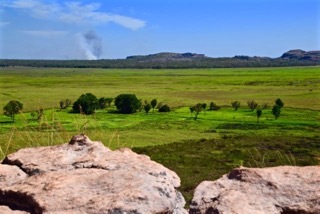 The landscape in this part of the National Park was very beautiful. 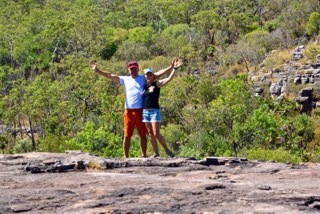 We started by walking the 1 km circular track that took us past several fascinating Aboriginal rock art sites. 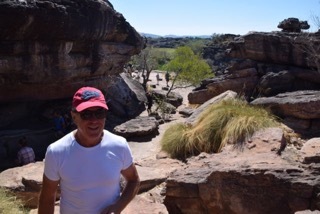 We passed many amazing rock arts and will share a few here with you. Each piece of art has an important message to give its readers. 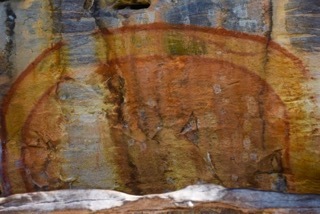 Mimi spirits were the first of the Creation Ancestors to paint on rock. They taught some Bininj how to paint and other Bininj learned by copying Mimi art. At the end of their journeys, some Creation Ancestors put themselves on rock walls as paintings and became djang (dreaming places). 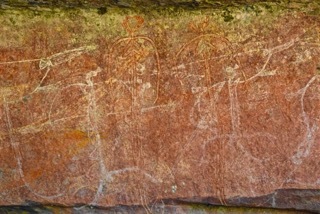 Some of these paintings are andjamun (sacred and dangerous) and can be seen only by senior men or women. 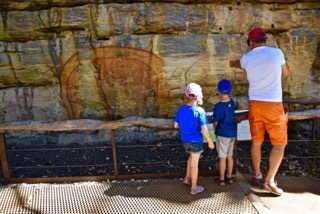 Kakadu’s rock art (gunbim) represents one of the longest historical records of any group of people in the world. 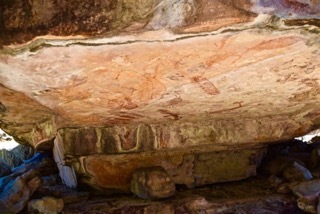 More than 5 000 art sites tell of the Creation Ancestors and the changes in the landscape over thousands of years. 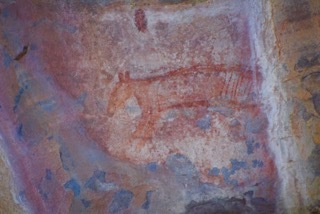 We saw naturalistic paintings of animals, for traditional X-ray art, and for paintings of the first European contact. The act of painting is generally more important than the painting itself, so many older paintings are covered by younger ones. The bones of this person have been swollen by Miyamiya, a sickness you can contract if you disturb the stones of a sacred site downstream near the East Alligator River. 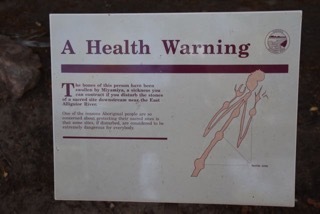 One of the reasons Aboriginal people are so concerned about protecting their sacred sites is that some sites, if disturbed, are considered to be extremely dangerous for everybody. 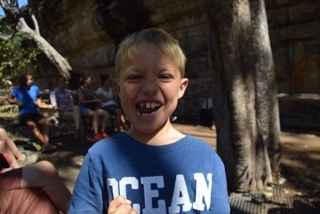 In the middle of our walk Alex lost a tooth!! We kept it safely in the pocket so we could make sure the tooth ferry will come tonight. 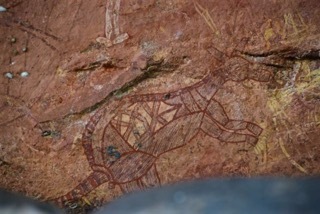 The Rainbow Serpent is a powerful ancestor of the Creation Time, known by many Aboriginal groups throughout Australia. 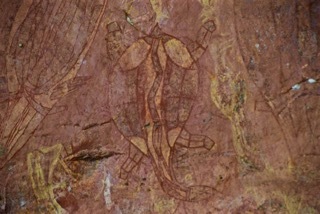 The Rainbow Serpent played an important role in the conception of Bininj / Mungguy and their cultural obligations to care for country. She is also part of life cycle of plants and animals and the seasonal changes. 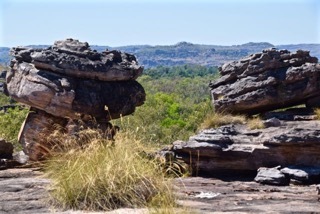 The many stories and sites associated with the Rainbow Serpent are often linked to water and places where she travelled across country, leaving behind features in the landscape. 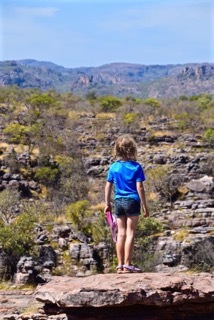 Bininj / Mungguy believe she is still present today, resting and should never be disturbed. 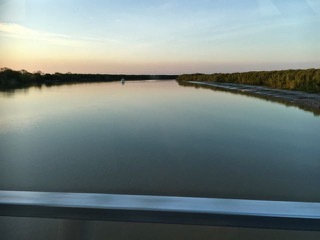 Aboriginal people are often reminded of the powers of the Rainbow Serpent during the wetter months when rainbows appear in the sky. 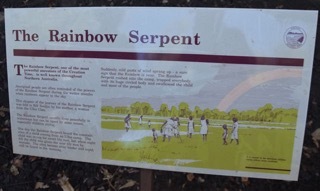 The Rainbow Serpent usually lives peacefully in waterways but can be upset by some noises, especially children crying. 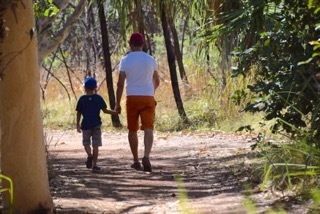 One day the Rainbow Serpent heard the constant cries of a child coming from an Ulbu camp. The child was crying for sweet lily root, but when night fell the child was given the sour lily root by mistake. The cries became even louder and could still be heard in the morning. Suddenly, cold gusts of wind sprand up - a sure sign that the Rainbow is near. The Rainbow Serpent rushed into the camp, trapped everybody with its huge circled body and swallowed the child and most of the people. 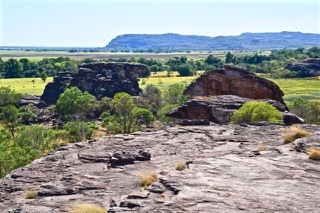 During the Creation Time, when the First People created the landscape and all it contains, Garranga’rreli visited this place as the Rainbow Serpent. 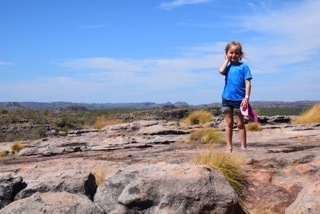 She painted her image on this rock to remind people of her visit. 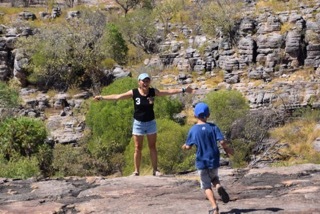 Her stop here is part of a longer creation path which links this place with Manngarre, the East Alligator River and other places in Arnhem Land. When girls and young woman are told about Garranga’rreli they learn about puberty and how to begin life as an adult. 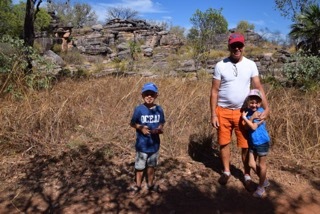 We continued our walk through this amazing landscape breathing the spirit of thousands of years of Aboriginal settlement. 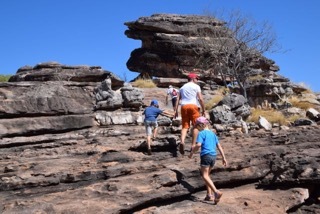 A moderate climb took us to the way of a rocky lookout passing by more Aboriginal rock art painted in some quite strange places. 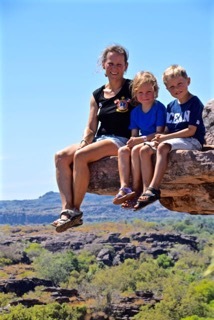 … finally overlooking the Nadab floodplain! 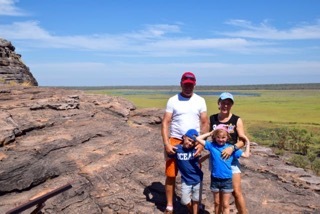 The view from the top was really breathtaking and we could have spent hours turning around 360 degrees being constantly blown away by this nature’s beauty! 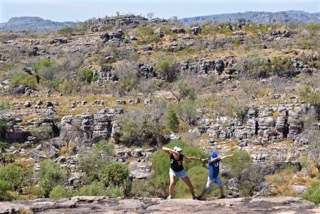 Alex teaching Mummy to do the “dab”. 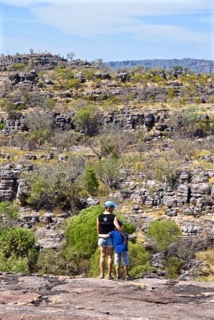 Mum and son. 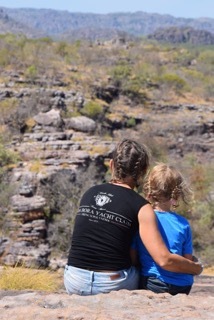 Mum and daughter. These pictures talk for themselves.. 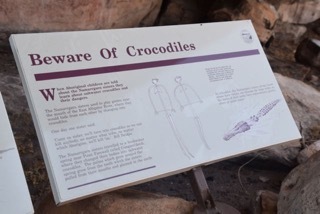 When Aboriginal children are told about the Namarrgarn sisters they learn about saltwater crocodiles and their dangers. 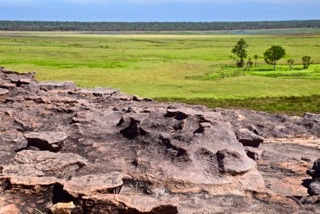 The Namarrgarn sisters used to play games near the mouth of the East Alligator River, where they would hide from each other by changing into crocodiles. One day one sister said: “Come on sister, we’ll turn into crocodiles so we can kill anybody, no matter what tribe, no matter which Aborigine, we’ll kill ‘im". 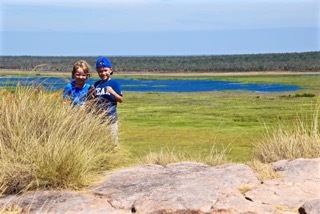 The Namarrgarn sisters travelled to a freshwater spring near Point Farewell called Gungarn’derdi, where they changed their bodies into saltwater crocodiles. 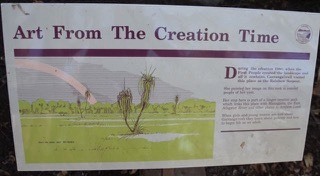 The palms which grow around the spring grew from the teeth which the sisters pulled from their mouths and planted in the earth. As crocodiles, the Namarrgarn sisters always know where their victims are because the large scales on the backs of their necks have extra-sensory powers above and under water. 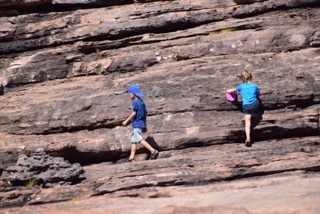 On our way down we were lucky to see a wallabie under a rock . The Thylacine Thylacines cynocephalis is sometimes called the “Tasmanian Tiger” due to it’s striped back. It was a shy and secretive hunter once found across Australia and Papua New Guinea, but in it’s final years, was only found in Tasmania. Thylacines were meat eaters and had a wolf-shaped head and backward-facing pouch to carry their young in, like a wombat. 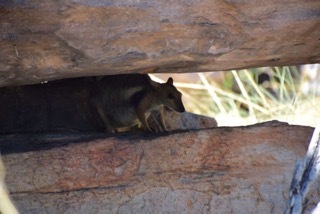 They lived in open forests and feel mainly on kangaroos and wallabies. 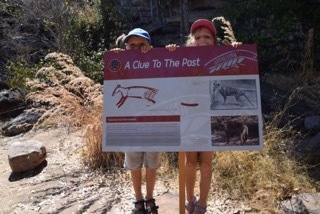 It is believed that Thylacine populations started their decline once dingoes came to Australia around 4 000 years ago. 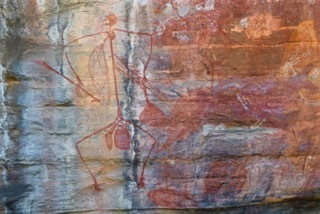 This image was most likely painted before their extinction, so it is estimated to be at least 4 000 years old! 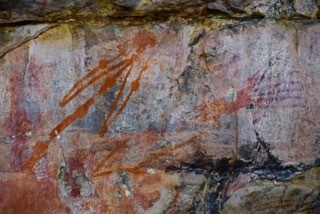 This painting of Mabuyu reminds Traditional Owners to tell a story which warns against stealing. Mabuyu was dragging this catch on a string after a fishing expedition when a gready person cut the string and stole his fish. That night, Mabuyu waited until the thieves had eaten his fish and were camped inside their cave near the East Alligator River. 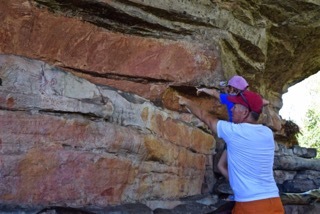 Then he blocked the cave with a huge rock. Next morning they never came out. Because they pinched it they got punished. Kids, ladies and men all dead.